phase of die development actual pressing forces only can be estimated. Only after the die is built and set in the press for the first time can the actual stamping loads be determined using press tonnage monitors. If actual tonnage exceeds the planned loading (tonnage), the die setter and engineer should consult to determine if the loading conditions are acceptable for the assigned machine. Often overlooked is the fact that an even distribution of the work load across the slide face (ram) is equally important. 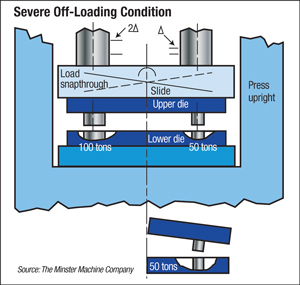 Ignoring load distribution can lead to die damage and eventually press damage, even when stamping loads remain well below the maximum rating of the press. Maintaining the correct punch-to-die clearance is a primary concern for producing high-quality stampings. When the working forces in a stampings die are not distributed evenly across the press slide, the slide will tip and move laterally in the direction of the greatest force. When the load is not centered under the press ram, critical die clearances may be altered. If this movement occurs while punches are engaged with other die components, excessive wear or damage can occur. Rapid die wear increases die maintenance costs and compromises the dimensional consistency of the stampings being produced. Unfortunately, some tooling engineers, process engineers, and setup personnel may not be aware of the negative effects of off-center loading on part quality and die life. As a result, dies will be designed, manufactured and installed in presses without consideration to centering the load. It is important to understand that a centered load and a centered die are not the same thing. The figure depicts a simple die that is centered in a press. The punching action generates a 100-ton load on the left side of the die and a 50-ton load on the right side, even though both punches are equally spaced from the press centerline. This situation generates a very large left-to-right tipping moment because the load on the left side of the press is twice as large as the load on the right. When the two upper die punches initially contact the material, the press slide is parallel with the bolster. Upon contact, the press deflects or stretches to build the required force to punch out the material. As this force builds, the load is distributed evenly to both punching stations. When the load reaches 50 tons, the right station begins shearing the material, while the left punch remains on top of the material as the press crank continues to develop the force necessary to stamp out that area (100 tons). This condition causes the slide to tip in a clockwise direction about the press centerline, as shown by the dashed line in the figure. When the right punch fractures the material, energy is released and this creates a reverse-loading condition. The downward force on the right adds to the clockwise tipping moment, further increasing non-parallelism of the slide. As a result, the right punch enters the lower die at an angle, creating excess punch wear and possible punch chipping. As the press continues to develop the 100 tons of force necessary to punch the remaining hole, the left punch begins shearing the material at an angle and the clockwise tipping moment continues to act on the slide. The snap-through load on the left side of the die now creates a downward force twice that of the right side. The end result is that the punches will enter the lower die at an angle and then willtip in the opposite direction while they still reside in the lower die. This leads to excessive die wear, damaged punches and poor part quality. The real problem occurs when attempts are made to improve die wear, reduce punch damage and improve part quality. Without an understanding of the actual load distribution across the press slide, these problems cannot be solved properly. New tool steels may be tried, different punches may be purchased or, worse yet, additional clearance may be added to the side of the die opening that keeps shearing. Eventually, a burr problem develops on the other side of the die opening because the clearance is too great due to the punch tilting when it cuts. As punch wear continues to be a problem, specialized surface coatings may be applied to the punches.